The winners of this year’s Tent, Caravan and Motorhome Owner Satisfaction Awards have been revealed. Club President Julia Bradbury was on hand to present the awards at The Midland Hotel in Manchester on the evening of 17 January. As in previous years, winners were crowned based entirely on the feedback given by the thousands of Club members, Practical Caravan and Practical Motorhome readers who completed the 2019 Owner Satisfaction Survey, which ran from February to November 2018. A total of 24 awards were presented at the ceremony, which is run by The Camping and Caravanning Club in partnership with Practical Caravan and Practical Motorhome magazines. Robert Louden MBE, Director General at The Camping and Caravanning Club, said: “We are pleased to continue our annual celebration into the best products on the market at the 2019 Owner Satisfaction Awards. Alastair Lewis, Managing Director (Hobbies) at Future Publishing, the publisher of both Practical magazine titles, said: “We're delighted to team up with The Camping and Caravanning Club once again to deliver this important survey of caravan and motorhome owners - our brands are all about helping people get the most out of their passion for caravan or motorhome travel and to buy the best kit to help them do that. 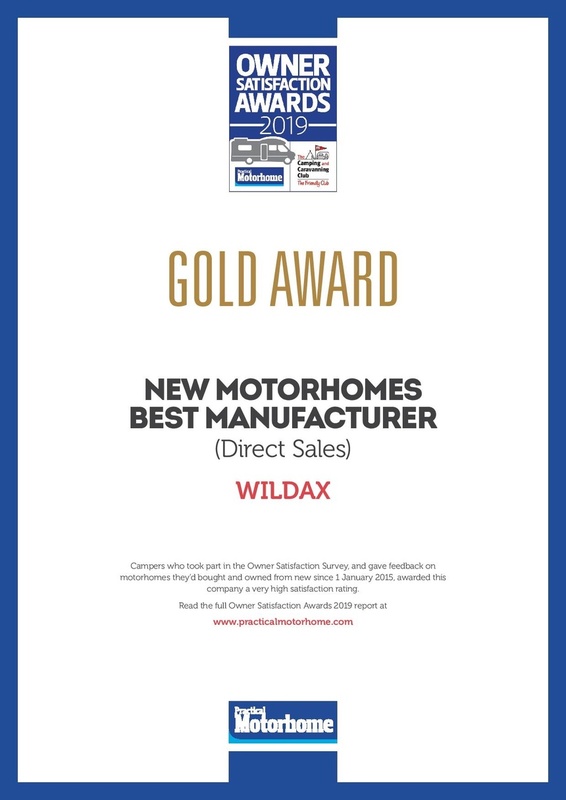 The caravan and motorhome awards both feature new categories for 2019, Best Motorhome Manufacturer and Best Caravan Manufacturer, awarded to the brands which score highest across both new and pre-owned categories based on UK new and used volume sales. Meanwhile, there was an increase in the number of 31-50 year olds who completed this year’s Tent Owner Satisfaction Survey, with more people paying less than £100 for their tent. The full results from the surveys, and detailed analysis, will be published in the February issues of Camping & Caravanning and Practical Caravan and the April issue of Practical Motorhome. To view the full list of gold and silver award winners in this year’s awards visit: www.practicalcaravan.com, www.practicalmotorhome.com or www.campingandcaravanningclub.co.uk/owner-satisfaction-awards.